Supercharged Car Suddenly Falls Flat, Boost and AFRs Appear Normal - Miata Turbo Forum - Boost cars, acquire cats. Last night, driving my car home, it all the sudden developed a weird issue where it would drive fine under low load but if I stepped on it and got in to boost around 3-4K, the car would fall flat in terms of power and sound like a brap brap brap. I'd let off and it would run normally again (in cruise and light acceleration). Looking at my boost gauge, boost and vac looked normal both cruising and punching it. Ditto on AFRs. Doing some reading here and elsewhere, I went the bad/clogged cat route as a likely culprit. Just got done pulling it and it looks just fine (not loose substrate, no clogs). Soooooo... any ideas? I have not logged it yet, as I have not had time between the issue developing and now when I just pulled the cat. Current plan is to reinstall the cat (RTV curing as I type this) and try driving it again and log it and see if that tells me anything. I've heard that every once in a while MS can have issues an need a restart, so maybe it will self fix over night (I know that is not likely). Last edited by Adam777; 09-22-2016 at 11:05 PM. Overboost protection? Unlikely if youve had this tune for a while, but possible. A log will tell you for sure. Also.. RTV on the cat? wuh? Last edited by Onyxyth; 09-22-2016 at 11:29 PM. No, not overboost for sure. I hit that in the early days of tuning the car and dealt with that issue long ago. This was different. The overboost cut off felt like the car was hitting a wall. This feels way down on power/speed but still climbs very slowly and sounds like ****. I'll report back after the log for sure, as I know that will be the most helpful. Just posting now to get it up in case someone has an easy answer w/o the log. Log will be here tomorrow at this time. RE: RTV, using copper RTV per Enthuza's recommendation to seal up to the exhaust and header. Not sure if the MS works without it disconnected or not, stock ecu does. I'll check the signal on the TPS when I log tonight with MS since it shows a reading. My buddy has suggested perhaps a bad coil(s). Sounds like spark blow out. Bad coil, fouled plug, something. But it isn't lighting off in the cylender it sounds like. My friend's car would do this any time the plugs were fouled. If it were the plugs, that would be great. Makes some sense since I am running rich with high intake temps (for now) and high EGTs (I am assuming, never measured). That certainly would be an easy and cheap solution. If it is a coil, I need to figure out exactly which Toyota PN mine are. Hopefull NAPA has one if that is what I need. Check your timing with a light. I had similar issues and it turned out my key and keyway were waisted. I thought it was spark blow out too. Wish it had been. Oof. God I hope it's not that. Big Nose crank so I hope it is unlikely. 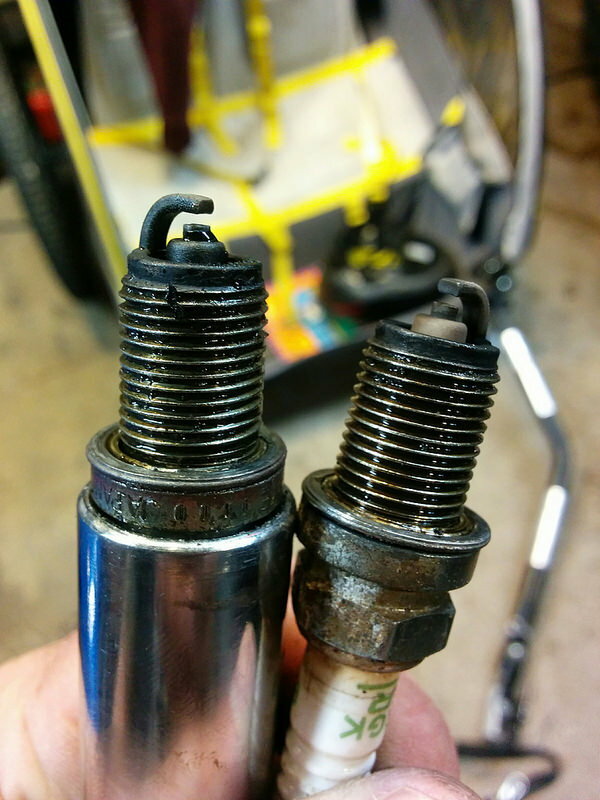 Plug 4 on the left compared to one from the other cylinders (all looks the same). 4 was wet and smelled like gas so... bad coil? Time to test that I guess via MS. It would appear to have been a bad coil on 4, right where that bad plug was. Thanks for the help! Megasquirt PNP Pro, Injectors, Fuel pumps and more. Funding my next car!